Translated from a Collection of Chapbooks Made in Moscow. Edited by Robert Steele. Illustrated by J. R. De Rosciszewski. 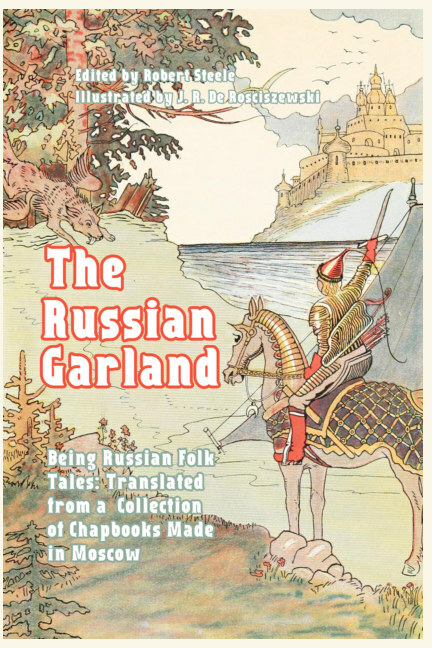 A selection of some of the very best traditional Russian Folk Tales, translated from the original peasant chapbooks dating from 1830s Moscow by famed medievalist Robert Steele. As Steele notes in his introduction, some of the tales are obviously of German origin—adopted and made Russian, like that of the “Seven Simeons” or “Emelyan, the Fool,” while others are as evidently Eastern. A few date from the Russian Epics, like that of “Iliya of Murom” and “Ivan the Peasant’s Son;” others are of later date, like that of “The Judgment of Shemyaka,” who was a historic character who lived about 1446. It is hardly necessary to dilate on the peculiar expressions here to be found; how that a child grows “not day by day, but hour by hour,” how that when the Tsar wants to drink, “beer is not brewed nor brandy distilled,” seeing he is served at once, how the hero passes through “thrice nine lands to the thirtieth country,” how brothers are always in threes, and how the youngest always succeeds where his elders fail. Students of folklore will know all about them, and the rest of us must take them on trust. Do you know why you must never go under a ladder? About the editor: Robert Steele (1860–1944) was a British scholar, best known for editing the 16-volume Opera hactenus inedita Rogeri Bacon. An early disciple of art scholar William Morris, Steele was drawn to medieval studies and manuscripts. 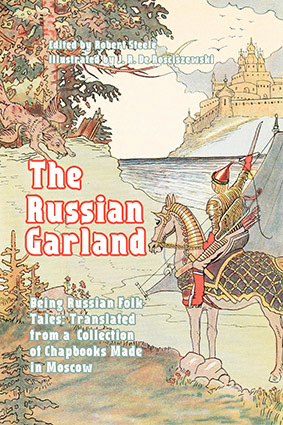 This specialization drew him to source libraries all over the world, including Russia where he was one of the first to find—and translate—the myriad of peasant chapbooks he found stashed in the Moscow archives. About the illustrator: Jan Junosza de Rosciszewski (1885–1956), better known as “Tom Titt,” was born in Warsaw, Poland, but moved to England as a young man to study art. His art dominated post Victorian London magazines, and he ended up as the theatrical caricaturist for the Tatler.